When hiking in Tasmania, a good set of maps is extremely important. 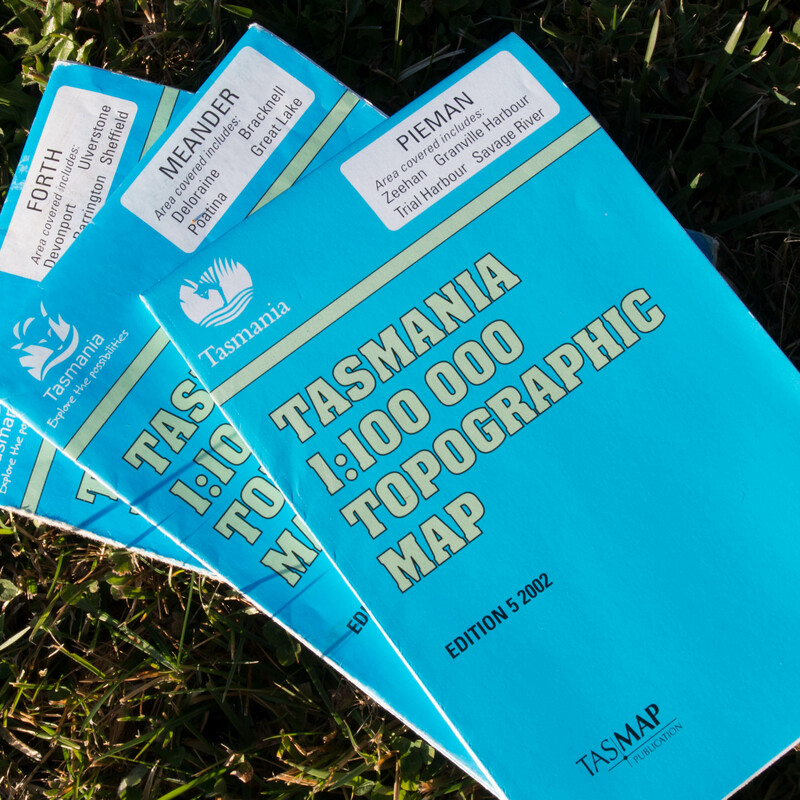 The Department of Primary Industry, Parks, Water and Environment (DPIWE) have available for sale the TasMap, an excellent set of Topographic maps that can be purchased directly from their website, or at any Service Tasmania outlet throughout the state. The website offers various other products as well, such as the 1:25,000 Digital Maps. The Digital Maps (Geomaps) contain GeoTiff data as well, meaning, with the correct software, you can click anywhere on the map to get the GPS Coordinates. Very handy indeed. I am properly prepared for the hike. If I get disoriented out bush (which is easy to do, I was once lost and off track, and yet, only 40 metres from a road), that I can use my map to help me identify landmarks close by, and to get myself back on track. Before you mention the merits of a GPS, and recording your hike with a GPS, I do that too. So, it is a bit alarming when the Tasmap you have purchased is missing information, or has the landmarks and features marked incorrectly. My first confusion occurred when I decided to visit Castra Falls, and do the 'Castra Circuit'. The circuit consists of 3 waterfalls and a couple of cascades. By walking the loop, you get to see all three major waterfalls, with a couple of small diversions from the track that take you to lovely cascades. I studied my Tasmap before driving to Nietta, Tasmania, and had planned to start at Castra Falls, followed by Silver Falls and then on to Step Falls, before looping back at my vehicle. So with the trip planned, I set out to Castra Rivulet in Nietta, and found my way to where the circuit begins. The hike commences very easily, and within 10 minutes you reach the first waterfall. The sign says it's Silver Falls, and yet my Tasmap tells me I should be looking at Castra Falls. As it turns out, the signage in the region is correct, and the Tasmaps have Silver Falls, and Castra Falls mixed up. I continued the hike following markers and ribbons that were placed by previous hikers. The 2nd waterfall on my hike was Castra Falls, So I immediately thought that I was somehow walking the opposite direction I had planned. Despite being confused, I continued along the track, following the markers, eventually arriving back to my vehicle. The next lot of issues I discovered by accident, when comparing one of the latest editions Tasmaps with an older edition. For the work I do for Waterfalls of Tasmania, I study each Tasmap carefully, highlighting each and every waterfall I can find, regardless if they're named. A good friend of mine, Tony Ritchie, who writes a column in The Examiner newspaper each week on inland fishing, gave me some older Tasmaps he had for different parts of Tasmania I was planning on exploring. One of the maps I had purchased, the 1:100,000 Arthur River map (Edition 4 2014), I compared with Tony's Edition 3 1991 version. To my surprise, McGowans Falls was completely missing from the new edition, despite being on the previous edition. In the case of the Edition 4 of Arthur River Tasmap, the mark on the maps that indicate the existence of a waterfall is completely missing, along with the name 'McGowans Falls'. For waterfall chasers, such as myself, McGowans falls is a substantial waterfall. So, the omission on the latest edition of Tasmap is perplexing. A telephone call was made by Waterfalls of Tasmania to the DPIWE explaining the issues found with McGowans Falls. The initial response back was It must be an error on the new edition of Arthur River Tasmap, and they asked us to email them with details of the inconsistencies. Consequently, we're trying to research all the latest editions of Tasmaps with previous editions, to create a comprehensive list of inconsistencies across Tasmap editions. We will be providing the DPIWE as thorough a list as possible, with the hope that future editions of Tasmaps will be more accurate. If you find any inconsistencies with your Tasmaps, please leave a comment below.